Chaining means that a server contacts other servers on behalf of a client application and then returns the combined results. Chaining is implemented through a database link, which points to data stored remotely. When a client application requests data from a database link, the database link retrieves the data from the remote database and returns it to the client. For more general information about chaining, see the chapter "Designing the Directory Topology," in the Red Hat Directory Server Deployment Guide. Section 20.8, “Monitoring Database Link Activity” covers how to monitor database link activity. Suffix information. 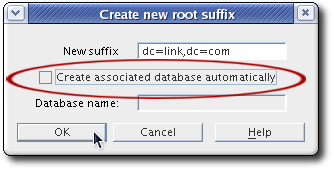 A suffix is created in the directory tree that is managed by the database link, not a regular database. This suffix corresponds to the suffix on the remote server that contains the data. Bind credentials. When the database link binds to a remote server, it impersonates a user, and this specifies the DN and the credentials for each database link to use to bind with remote servers. LDAP URL. 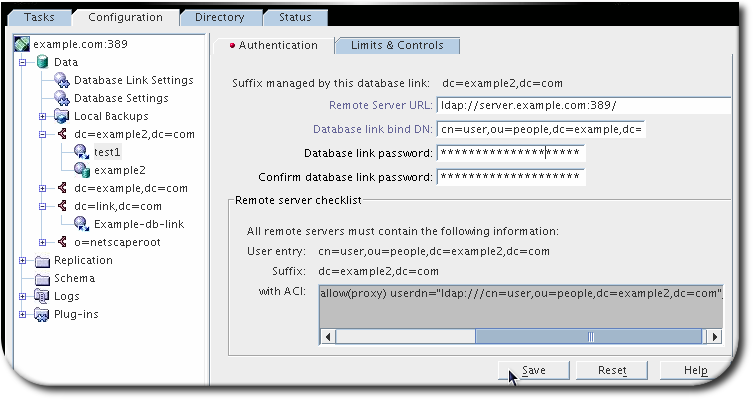 This supplies the LDAP URL of the remote server to which the database link connects. The URL consists of the protocol (ldap or ldaps), the host name or IP address (IPv4 or IPv6) for the server, and the port. List of failover servers. This supplies a list of alternative servers for the database link to contact in the event of a failure. This configuration item is optional. If secure binds are required for simple password authentication (Section 19.11.1, “Requiring Secure Binds”), then any chaining operations will fail unless they occur over a secure connection. Using a secure connection (TLS and Start TLS connections or SASL authentication) is recommended, anyway. Create a new suffix as described in Section 2.1.1, “Creating Suffixes”. Deselect the Create associated database automatically check box. It is simpler to configure a database link on a suffix without a database associated with it because having both a database and database link requires custom distribution functions to distribute directory data. In the left pane, right-click the new suffix, and select New Database Link from the pop-up menu. Fill in the database link name. The name can be a combination of alphanumeric characters, dashes (-), and underscores (_). No other characters, like spaces, are allowed. Set the radio button for the appropriate method for authentication. Simple means that the server connects over the standard port with no encryption. The only required information is the bind DN and password for the user as whom the server connects to the remote server. Server TLS/SSL Certificate uses the local server's TLS certificate to authenticate to the remote server. A certificate must be installed on the local server for certificate-based authentication, and the remote server must have certificate mapping configured so that it can map the subject DN in the local server's certificate to the corresponding user entry. When the database link and remote server are configured to communicate using TLS, this does not mean that the client application making the operation request must also communicate using TLS. The client can bind using a normal port. SASL/DIGEST-MD5 requires only the bind DN and password to authenticate. SASL/GSSAPI requires the local server to have a Kerberos keytab (as in Section 9.10.2.2, “About the KDC Server and Keytabs”), and the remote server to have a SASL mapping to map the local server's principal to the real user entry (as in Section 9.9.3.1, “Configuring SASL Identity Mapping from the Console”). Use TLS/SSL. This uses a secure connection over the server's secure LDAPS port, such as 636. This setting is required to use TLS/TLS. When using TLS, make sure that the remote server's port number is set to its secure port. In the Remote Server Information section, fill in the name (host name, IPv4 address, or IPv6 address) and port number for the remote server. For any failover servers, fill in the host name and port number, and click the Add button. A failover server is a backup server, so that if the primary remote server fails, the database link contacts the first server in the failover servers list and cycles through the list until a server is accessed. The new database link is listed under the suffix, in place of the database. The Console provides a checklist of information that needs to be present on the remote server for the database link to bind successfully. To view this checklist, click the new database link, and click the Authentication tab. The checklist is in the Remote server checklist box. Use the ldapmodify command-line utility to create a new database link. The new instance must be located in the cn=chaining database,cn=plugins,cn=config entry. Default configuration attributes are contained in the cn=default instance config,cn=chaining database,cn=plugins,cn=config entry. These configuration attributes apply to all database links at creation time. Changes to the default configuration only affect new database links. 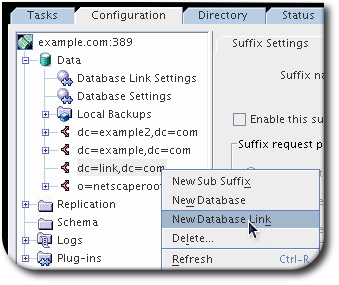 The default configuration attributes on existing database links cannot be changed. Each database link contains its own specific configuration information, which is stored with the database link entry itself, cn=database_link, cn=chaining database,cn=plugins,cn=config. For more information about configuration attributes, see the Red Hat Directory Server Configuration, Command, and File Reference. The suffix information is stored in the cn=database_link, cn=chaining database,cn=plugins,cn=config entry. After creating the database link, any alterations to the nsslapd-nsslapd-suffix attribute are applied only after the server containing the database link is restarted. For a request from a client application to be chained to a remote server, special bind credentials can be supplied for the client application. This gives the remote server the proxied authorization rights needed to chain operations. Without bind credentials, the database link binds to the remote server as anonymous. Create an administrative user for the database link. For information on adding entries, see Chapter 3, Managing Directory Entries. Provide proxy access rights for the administrative user created in step 1 on the subtree chained to by the database link. On the server containing the database link, use ldapmodify to provide a user DN for the database link in the nsMultiplexorBindDN attribute of the cn=database_link,cn=chaining database,cn=plugins,cn=config entry. The nsMultiplexorBindDN cannot be that of the Directory Manager. Use ldapmodify to provide a user password for the database link in the nsMultiplexorCredentials attribute of the cn=database_link,cn=chaining database,cn=plugins,cn=config entry. For example, a client application sends a request to Server A. Server A contains a database link that chains the request to a database on Server B.
Server B must contain a user entry corresponding to the nsMultiplexorBindDN, and set the proxy authentication rights for this user. To set the proxy authorization correctly, set the proxy ACI as any other ACI. Carefully examine access controls when enabling chaining to avoid giving access to restricted areas of the directory. For example, if a default proxy ACI is created on a branch, the users that connect using the database link will be able to see all entries below the branch. There may be cases when not all of the subtrees should be viewed by a user. To avoid a security hole, create an additional ACI to restrict access to the subtree. For more information on ACIs, see Chapter 18, Managing Access Control. When a database link is used by a client application to create or modify entries, the attributes creatorsName and modifiersName do not reflect the real creator or modifier of the entries. These attributes contain the name of the administrative user granted proxied authorization rights on the remote data server. On the server containing the database link, identify the remote server that the database link connects with using an LDAP URL. Unlike the standard LDAP URL format, the URL of the remote server does not specify a suffix. It takes the form ldap://server:port, where the server can be a host name, IPv4 address, or IPv6 address. The URL of the remote server using the nsFarmServerURL attribute is set in the cn=database_link, cn=chaining database,cn=plugins,cn=config entry of the configuration file. Do not forget to use the trailing slash (/) at the end of the URL. TLS has to be enabled on the local Directory Server and the remote Directory Server to be chained over TLS. For more information on enabling TLS, see Section 9.4, “Enabling TLS”. There can be additional LDAP URLs for servers included to use in the case of failure. Add alternate servers to the nsFarmServerURL attribute, separated by spaces. In this sample LDAP URL, the database link first contacts the server example.com on the standard port to service an operation. If it does not respond, the database link then contacts the server us.example.com on port 389. If this server fails, it then contacts africa.example.com on port 1000. The local server can connect to the remote server using several different connection types and authentication mechanisms. Ultimately, there are two connection settings. The TLS option signifies that both of the servers are configured to run and accept connections over TLS, but there is no separate configuration attribute for enforcing TLS. The connection type is identified in the nsUseStartTLS attribute. When this is on, then the server initiates a Start TLS connect over the standard port. If this is off, then the server either uses the LDAP port or the LDAPS port, depending on what is configured for the remote server in the nsFarmServerURL attribute. There are four different methods which the local server can use to authenticate to the farm server. empty. If there is no bind mechanism set, then the server performs simple authentication and requires the nsMultiplexorBindDN and nsMultiplexorCredentials attributes to give the bind information. EXTERNAL. This uses an TLS certificate to authenticate the farm server to the remote server. Either the farm server URL must be set to the secure URL (ldaps) or the nsUseStartTLS attribute must be set to on. Additionally, the remote server must be configured to map the farm server's certificate to its bind identity, as described in the certmap.conf section in the Red Hat Directory Server Configuration, Command, and File Reference. DIGEST-MD5. This uses SASL authentication with DIGEST-MD5 encryption. As with simple authentication, this requires the nsMultiplexorBindDN and nsMultiplexorCredentials attributes to give the bind information. GSSAPI. This uses Kerberos-based authentication over SASL. The farm server must be configured with a Kerberos keytab, and the remote server must have a defined SASL mapping for the farm server's bind identity. Setting up Kerberos keytabs and SASL mappings is described in Section 9.9, “Setting up SASL Identity Mapping”. SASL connections can be established over standard connections or TLS connections. The following table lists the attributes available for configuring a database link. Some of these attributes were discussed in the earlier sections. All instance attributes are defined in the cn=database_link, cn=chaining database,cn=plugins,cn=config entry. Values defined for a specific database link take precedence over the global attribute value. nsTransmittedControls [†] Gives the OID of LDAP controls forwarded by the database link to the remote data server. nsslapd-suffix The suffix managed by the database link. Any changes to this attribute after the entry has been created take effect only after the server containing the database link is restarted. nsslapd-timelimit Default search time limit for the database link, given in seconds. The default value is 3600 seconds. nsslapd-sizelimit Default size limit for the database link, given in number of entries. The default value is 2000 entries. nsFarmServerURL Gives the LDAP URL of the remote server (or farm server) that contains the data. This attribute can contain optional servers for failover, separated by spaces. If using cascading chaining, this URL can point to another database link. nsUseStartTLS Sets whether to use Start TLS to establish a secure connection over a standard port. The default is off, which is used for both simple (standard) connections and TLS connections. nsBindMechanism Sets the authentication method to use to authenticate (bind) to the remote server. If you set an empty value, simple bind is used (LDAP_SASL_SIMPLE). nsMultiplexorBindDN DN of the administrative entry used to communicate with the remote server. The term multiplexor in the name of the attribute means the server which contains the database link and communicates with the remote server. This bind DN cannot be the Directory Manager. If this attribute is not specified, the database link binds as anonymous. nsMultiplexorCredentials Password for the administrative user, given in plain text. If no password is provided, it means that users can bind as anonymous. The password is encrypted in the configuration file. nsCheckLocalACI Reserved for advanced use only. Controls whether ACIs are evaluated on the database link as well as the remote data server. Takes the values on or off. Changes to this attribute occur only after the server has been restarted. The default value is off. nsProxiedAuthorization Reserved for advanced use only. Disables proxied authorization. A value of off means proxied authorization is disabled. The default value is on. nsActiveChainingComponents[†] Lists the components using chaining. A component is any functional unit in the server. The value of this attribute in the database link instance overrides the value in the global configuration attribute. To disable chaining on a particular database instance, use the value none. The default policy is not to allow chaining. For more information, see Section 2.3.2.1, “Chaining Component Operations”. nsReferralOnScopedSearch Controls whether referrals are returned by scoped searches. This attribute is for optimizing the directory because returning referrals in response to scoped searches is more efficient. Takes the values on or off. The default value is off. nsHopLimit Maximum number of times a request can be forwarded from one database link to another. The default value is 10. [†] Can be both a global and instance attribute. This global configuration attribute is located in the cn=config,cn=chaining database,cn=plugins,cn=config entry. The global attributes are dynamic, meaning any changes made to them automatically take effect on all instances of the database link within the directory. 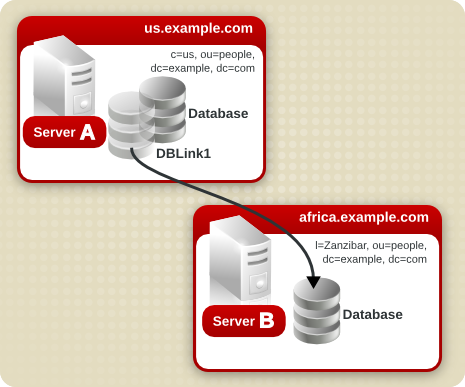 Suppose a server within the us.example.com domain contains the subtree l=Walla Walla,ou=people,dc=example,dc=com on a database and that operation requests for the l=Zanzibar,ou=people,dc=example,dc=com subtree should be chained to a different server in the africa.example.com domain. In the first entry, the nsslapd-suffix attribute contains the suffix on Server B to which to chain from Server A. The nsFarmServerURL attribute contains the LDAP URL of Server B. The second entry creates a new suffix, allowing the server to route requests made to the new database link. The cn attribute contains the same suffix specified in the nsslapd-suffix attribute of the database link. The nsslapd-backend attribute contains the name of the database link. The nsslapd-parent-suffix attribute specifies the parent of this new suffix, ou=people,dc=example,dc=com. Do not use the Directory Manager user as the proxy administrative user on the remote server. This creates a security hole. This ACI gives the proxy admin user read-only access to the data contained on the remote server within the l=Zanzibar,ou=people,dc=example,dc=com subtree only. When a user binds to a database link, the user's identity is sent to the remote server. Access controls are always evaluated on the remote server. For the user to modify or write data successfully to the remote server, set up the correct access controls on the remote server. For more information about how access controls are evaluated in the context of chained operations, see Section 2.3.6, “Database Links and Access Control Evaluation”. These procedures describe configuring how Directory Server chains requests made by client applications to Directory Servers that contain database links. This chaining policy applies to all database links created on Directory Server. A component is any functional unit in the server that uses internal operations. For example, plug-ins are considered to be components, as are functions in the front-end. However, a plug-in may actually be comprised of multiple components (for example, the ACI plug-in). Some components send internal LDAP requests to the server, expecting to access local data only. For such components, control the chaining policy so that the components can complete their operations successfully. One example is the certificate verification function. Chaining the LDAP request made by the function to check certificates implies that the remote server is trusted. If the remote server is not trusted, then there is a security problem. By default, all internal operations are not chained and no components are allowed to chain, although this can be overridden. Additionally, an ACI must be created on the remote server to allow the specified plug-in to perform its operations on the remote server. The ACI must exist in the suffix assigned to the database link. When enabling the Referential Integrity plug-in on servers issuing chaining requests, be sure to analyze performance, resource, and time needs as well as integrity needs. Integrity checks can be time-consuming and draining on memory and CPU. For further information on the limitations surrounding ACIs and chaining, see Section 18.5, “Limitations of ACIs”. Expand Data in the left pane, and click Database Link Settings. Select the Settings tab in the right window. Click the Add button in the Components allowed to chain section. Select the component to chain from the list, and click OK. Restart the server in order for the change to take effect. Specify components to include in chaining using the nsActiveChainingComponents attribute in the cn=config,cn=chaining database,cn=plugins,cn=config entry of the configuration file. See Section 2.3.2.1, “Chaining Component Operations” for a list of the components which can be chained. Virtual List View (VLV). This control provides lists of parts of entries rather than returning all entry information. Server-side sorting. This control sorts entries according to their attribute values, usually using a specific matching rule. Dereferencing. This control tracks back over references in entry attributes in a search and pulls specified attribute information from the referenced entry and returns it with the rest of the search results. Managed DSA. This controls returns smart referrals as entries, rather than following the referral, so the smart referral itself can be changed or deleted. Loop detection. This control keeps track of the number of times the server chains with another server. When the count reaches the configured number, a loop is detected, and the client application is notified. For more information about using this control, see Section 2.4.4, “Detecting Loops”. Server-side sorting and VLV controls are supported only when a client application request is made to a single database. Database links cannot support these controls when a client application makes a request to multiple databases. Expand the Data folder in the left pane, and click Database Link Settings. Click the Add button in the LDAP Controls forwarded by the database link section to add an LDAP control to the list. 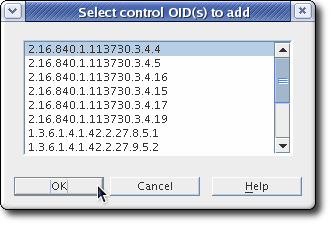 Select the OID of a control to add to the list, and click OK. In addition, if clients of the Directory Server create their own controls and their operations should be chained to remote servers, add the OID of the custom control to the nsTransmittedControls attribute. All of the information for the database link for the connection to the remote server. In the left pane, expand the Data folder, and select the database link under the suffix. In the right navigation pane, click the Authentication tab. The LDAP URL for the remote server. The bind DN and password used by the database link to bind to the remote server. Configuring the default settings for database links defines the settings used for cascading chaining (the number of hops allowed for a client request), the connection rules for the remote server, and how the server responds to client requests. Expand the Data folder in the left pane, and click Database Link Settings. Open the Default Creation Parameters tab. Fill in the new configuration parameters. Changes made to the default settings of a database link are not applied retroactively. Only the database links created after changes are made to the default settings will reflect the changes. To delete a database link, right-click the database link, and select Delete from the pop-up menu. Confirm the delete when prompted. 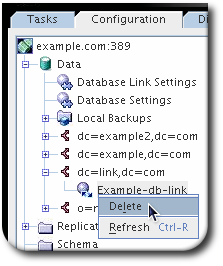 Under Data in the left navigation pane, open the suffix and select the database link to delete. Right-click the database link, and select Delete from the menu. Not all types of access control can be used. For example, role-based or filter-based ACIs need access to the user entry. Because the data are accessed through database links, only the data in the proxy control can be verified. Consider designing the directory in a way that ensures the user entry is located in the same database as the user's data. All access controls based on the IP address or DNS domain of the client may not work since the original domain of the client is lost during chaining. The remote server views the client application as being at the same IP address and in the same DNS domain as the database link. ACIs must be located with any groups they use. If the groups are dynamic, all users in the group must be located with the ACI and the group. If the group is static, it links to remote users. ACIs must be located with any role definitions they use and with any users intended to have those roles. ACIs that link to values of a user's entry (for example, userattr subject rules) will work if the user is remote. During access control evaluation, contents of user entries are not necessarily available (for example, if the access control is evaluated on the server containing the database link and the entry is located on a remote server). For performance reasons, clients cannot do remote inquiries and evaluate access controls. The database link does not necessarily have access to the entries being modified by the client application. When performing a modify operation, the database link does not have access to the full entry stored on the remote server. If performing a delete operation, the database link is only aware of the entry's DN. If an access control specifies a particular attribute, then a delete operation will fail when being conducted through a database link. By default, access controls set on the server containing the database link are not evaluated. To override this default, use the nsCheckLocalACI attribute in the cn=database_link, cn=chaining database,cn=plugins,cn=config entry. However, evaluating access controls on the server containing the database link is not recommended except with cascading chaining. Unlike the standard LDAP URL format, the URL of the remote server does not specify a suffix. It has the form ldap://server:port/, where server can be the host name, IPv4 address, or IPv6 address.